We are proud to be Ireland’s biggest and best Laser Tag Centre. With over 5,000sq.ft. of black light combat arena and the latest systems in Laser Tag. See real lasers fire from your gun and others as they try to shoot you! Play in a dense fog, with flashing lights and pumping music, defend your team, attack the other team or play solo games. This is ideal for all ages from 7 to 77!! Take 10% Off Monday to Thursday OR have a group of 4 or more. *offer excludes school and bank holidays. 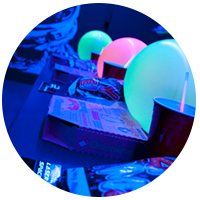 Experience the ideal party atmosphere here at Lock n Load, the ultimate laser adventure! We specialise in birthday parties for a range of age groups. We can provide as much as you like, from invitations, food and party bags we have everything covered for a stress free and most importantly FUN party. Extra Laser Tag Game -£2.00 p.p. We welcome ages 6 and under to Lock n Load. They can play Neon Mini-Golf but will be unable to enter the laser tag arena. Check out or Nerf Nights for all ages. Whether it’s for a party, staff do, club outing or just for kicks get a few of the crew together for adrenalin filled fun with a Laser Tag gun. Play team missions or solo games you’ll get to choose on the day from our huge game selection. Laser tag is a high-tech, live action game played in themed arenas where special effects, fog, laser beams, pulse-pumping music and other players create an exciting and entertaining adventure. Lock n Load specialises in group entertainment to ensure your group have an experience to talk about for years to come! Further discounts available for youth clubs, schools & sports clubs. 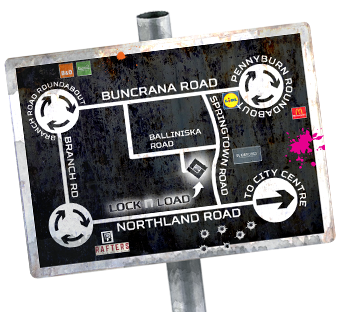 We have Ireland's largest mobile laser tag maze that can come to you anywhere any time. This is perfect for all occasions from parties, BBQs, festivals, fairs, weddings, fundraiser events, schools, indoor sports halls, we could go on but we're sure you get the point. Bringing are laser guns which are state of the art technology. See real laser beams fire out from your gun, through the swirling fog and numerous tunnels. Track down and deactivate your opponents’ guns and be the successor for your team. We also bring an LED score board so there's no doubting the winner.